This is an average story with a little bit about family and revenge that exists solely as a prequel to “The Cape.” It’s good enough to be given away on Free Comic Book Day or included in a hardcover but as a standalone it really achieves very little. It isn’t bad, maybe a little simplistic or jingoistic but there are much better reads for your time. The art is very good and kind of reminds me of American Vampire. There are some brilliant moments when letters are combined with pictures to create a Meta view. The colouring has a dank jungle feel and makes very good use of browns. The whole thing just felt like an ad break or a short for the main feature, which is what it is. 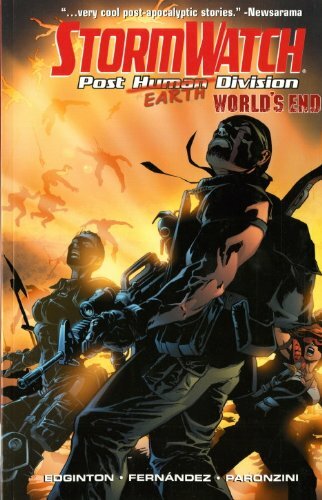 The Wildstorm Universe had one of those infinitely annoying world shattering events. As a result all their books got hijacked. If you are a Stormwatch fan you could easily be forgiven for missing out this volume. There isn’t really any character development and it doesn’t seek to build on what has come before. It’s just Hollywood action sequences. Poor Warren Ellis must be turning in his metaphorical grave. The art is fine. 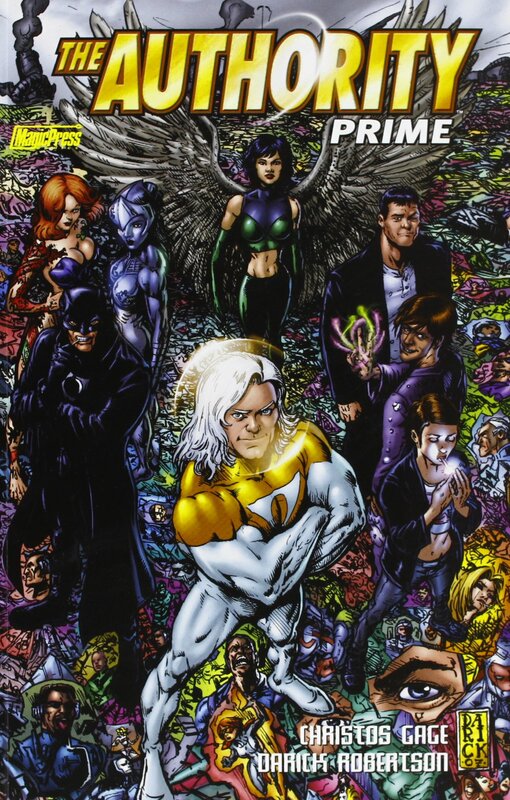 What really hits the spot is the Wildstorm colouring. Such vibrant, powerful colours, brilliant lighting effects and expertly chosen pallets make for plenty of style. But it can’t make up for lack of substance. Stormwatch and The Authority turn up and fight each other over some old Bendix hardware before teaming up to fight the man himself. Or his hologram. Or his clone, Or his A.I. Or whatever the Bendix of the week is. Didn’t the Fantastic Four do this in the 1960’s? Gage has done some good and some bad work. Despite the hackneyed plot and blatant sequel bait this isn’t without redemption. If you can remember the original Stormwatch, with Lamplighter et al., then there are plenty of hidden gems for you. Otherwise this is a six issue fight scene with constant jabbering. Whilst there are clever twists and some jeopardy it isn’t a taxing or meaningful read. Robertson puts a lot of effort into livening up the fight scenes but outlines can feel too heavy at times. There is good lighting and adept panel structure but it’s all about the words and not the pictures unfortunately. There is also an irrelevant use of the Cthulhu Mythos as an opener. Clearly Gage has either never read or understood Lovecraft’s work. It’s bonkers. And not in a Grant Morrison, good bonkers, kind of way. Apparently it lasted 12 issues but only four are collected here and there were no more Trades. In Stormwatch P.H.D it is hinted that these events here are in fact an L.S.D. trip. The art is disappointing. It takes the Stormwatch model, paints it black and adds digital highlights. There are one or two good quirks but nothing that benefits or elevates the story. This is a very thick book packed with facts, figures, dates and history. It is unfortunately mind numbingly boring. If you use it as a reference book to look up the potted history of a character or occasionally browse some of the more in-depth articles on the history of comics it is fine. Five minute chunks here and there are ok. If you try and read more the giant slabs of text and monotone commentary proves unpalatable. For a book dealing with visual media there are no helpful timelines or other snazzy graphics to make the facts more digestible. There are a lot of comic covers however and pre-internet this would have been a great chance to see rare art you never would. 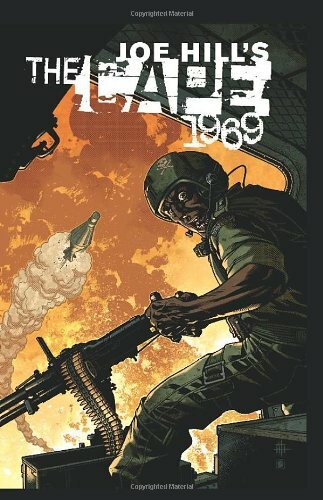 The chapters start with male heroes at 193 pages and get progressively shorter as they go through female heroes, teams, newspaper heroes, war heroes, western heroes and sci-fi heroes. There is also a 30 page introduction that takes you through the history of comics. Good for research but dull as ditchwater. This is last volume and you’ve been expecting a twist haven’t you. Some clever revelation about the house. Well sadly there isn’t one. The mystery is solved and some revelations come out but without significant foreshadowing they are of little value. The good point about these four volumes is the journey. The mystery, the development of the characters and the suspense is what has drawn you here. In the 1970’s this may have been a fresh and original work, although it did receive criticism for being similar to other novels of the time. Today the ending appears rather flat. Maybe it’s the way you tell them as all the elements are there for an interesting finale. A capable end but not all it could have been. There is a reason the Da Vinci Code was a book first. That’s because it has a lot of big concepts and history and requires a lot of text to convey that to you. 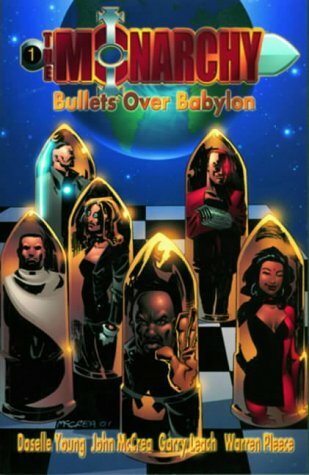 This graphic novel explores a similar set of Biblical and philosophical ideas. It also uses 20th century English writers as the heroes and occultist Alistair Crowley as the villain. This is certainly an unusual idea, more so because it comes from Image Comics. It is also a premise that would probably work better in a different format. That isn’t to say the pictures aren’t useful but when the massive blocks of text appear the pictures degenerate into talking heads or disappear completely. Unless you possess a wealth of knowledge of the history or theology in question you will be genuinely stumped in places. Luckily there more than a dozen pages of annotations that, whilst present to bolster the credibility of the storyline, do act as a breadcrumb trail. The art is hard black and white, an interesting choice for the grey world of existentialism. The panels are more or less regular and there are few artistic techniques that have an impact on you. It is helpful to have illustrations when the subject turns to hidden meanings in paintings or statues, or when people’s consciousness moves forwards or backwards in time. This isn’t something you read for entertainment. It also isn’t a hard debate on some of the more apocryphal branches of religion. As such it is hard to judge if this work is a success or not. But fair play to Harris for convincing a large publisher to print something that is the complete opposite to all their other books. Oh dear god it’s awful! Please make it stop. These aren’t the things you should be saying when reading something you enjoy. Maybe it is time to stop. There are two stories here and the first appears to confuse Lara Croft with James Bond. It is dire and the twist at the end is poor indeed. The second tries a lot harder. Lara becomes a little more vulnerable and human and we see some competent storytelling daring to emerge. The art is typical of the previous books and where there are lots attempts to inject motion and excitement onto the page many of these don’t work. The lettering also has spelling mistakes. Yes that’s plural. 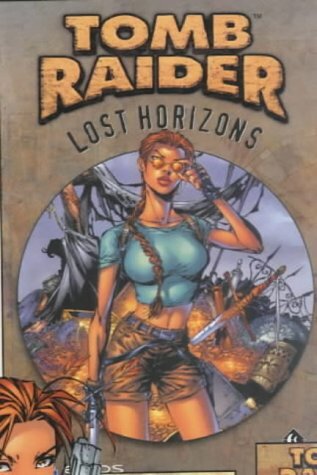 The fact that Eidos and Core would put their names to something like this is also a travesty. It could have been more, but no thumbs today. Welcome to Batman in space. Yep he goes into space and fights aliens on their spaceship. ‘Cause that’s what Batman is famous for right? This is the kind of shallow nonsense that four year olds make up with their action figures. Actually no they don’t, they make Axe Cop which is way better. 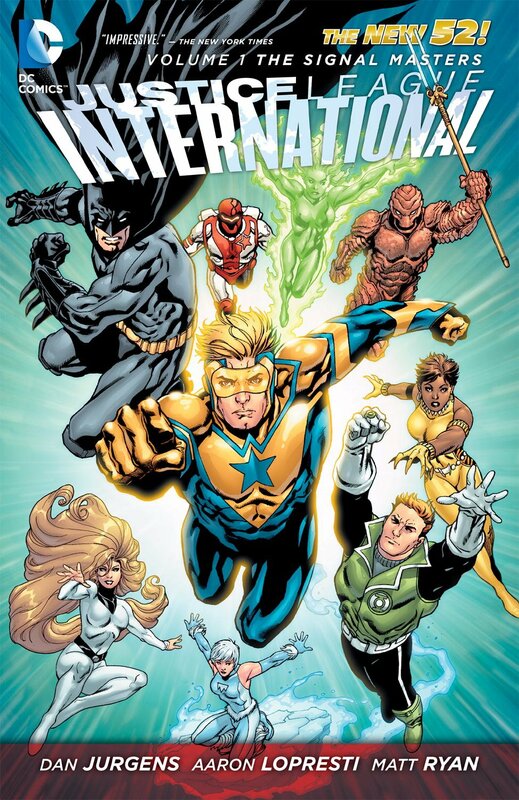 A collection of second tier super heroes from around the world is formed into a team by the United Nations. They must then fight a threat from space the moment after they have just met each other. Cue petty squabbles and Jingoism. And Batman stows away on their plane too. This could have tackled some real-world concerns. It makes no use of the United Nations, its remit, its history, or its failings whatsoever. There is a tiny mention of people mistrusting their governments, seeking change and crying out against corruption and profiteering but those people then plant bombs and are written off as terrorists. Clearly this is the Fox News of comics. The art is garish, bombastic and gratuitous in the extreme. There are flashes of talent and potential but the whole thing is smothered in sickly dayglo. It is polished but it is still just going through the motions. Just because you have a bunch of characters sitting around doing nothing doesn’t mean you should cram them into a book at the first opportunity. If you have to add Batman to make it work you really shouldn’t have bothered. This is what you get is you cross the Carry On films with superheroes. Whereas the last volume had a lot to say and quite a bit of heart this doesn’t. It is like the shameless cash-in sequel. It isn’t bad and will make you smile and laugh while playing spot the pop culture reference but it is definitely a vanity project. This is the kind of thing that makes a great free web-comic. You will enjoy reading it but might object to paying for it. The art is just as delightful as the previous volume. Garish and bombastic in the best way possible. There is talent and enthusiasm and it complements the bawdy nature of the piece perfectly. If it were longer it would make more of an impression but in the shadow is its superior predecessor there are No Thumbs today.